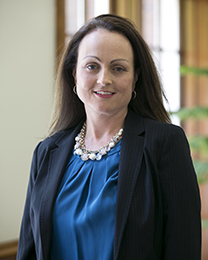 Laura Hendley Tomlin came to Samford University in 2008 as the director of the Paralegal Studies Certificate Program. She took on the additional role of executive director of the Evening College at Samford University in 2009. In 2014, she moved to Cumberland School of Law as director of Paralegal Studies and Special Programs, returning the paralegal program to the law school, where it had resided from its inception to 1996. Tomlin is responsible for both the Paralegal Studies Certificate Program and the Master of Studies in Law. Tomlin received a B.A. in English from Birmingham-Southern College, a J.D. from Hamline University School of Law, and a Master of Science in Education from Samford University. She has been published in Facts & Findings and The Paralegal Educator, and has presented at numerous conferences devoted to legal education and higher education administration. Tomlin is a member of the American Association for Paralegal Education (AAfPE) and the University Professional and Continuing Education Association (UPCEA).